The Rangers have been in London as long as hockey and continue to assemble the best squad in town. Historically, the club came together in 1989 as the Berlin wall began to crumble, Mike Tyson became the Heavyweight Champ and Hulk Hogan defeated Macho Man Randy Savage during the greatest Wrestlemana of all time. Formed by a group of ex-pats looking for something other than soccer to play, the possibility of starting a hockey team was a natural choice. Upon finding some late night ice in some of the most bizarre rinks on this side of the Atlantic, IHI (Ice Hockey International) was born. To date the team has had players from all over the world. Players often come and go as London is a very transient place, but even so, the Rangers are proud to still have original members on the roster who play week in and week out. The last professional Ice hockey club to play out of London, the Racers competed in Britain’s Elite Ice Hockey League from 2002 – 2005. The club disbanded in late 2005 due to unfavourable facility conditions. In Ranger antiquity, several members of the club came together to embark on returning professional ice hockey to London. After a very dedicated effort in pulling together a quality roster, coaching staff and front office, the Racers were born. During the Racers three years in London, countless Rangers devoted hours to promoting the sport of ice hockey throughout the city, while actively trying to attract both kids and adults to the game. 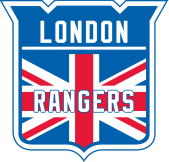 Even though it has been nearly seven years since the Racers last played, the legacy of professional ice hockey in London lives on and is best carried forth by the London Rangers!